IG FISH. It’s why we fish, right? An old truism holds that new anglers just want to catch a fish, then they progress to catching lots of fish. After a while, “lots of fish” loses ground to “one big fish.” Eventually (so I hear) the ultimate angler ascends, in a moment of religious enlightenment, to merely enjoying the experience of fishing. Personally, I’ve found that I sure tend to enjoy the experience a whole lot more while I’m catching lots of big fish, but I admit I’m still working out that whole Zen thing. Regardless of your motivation, there are in fact things you can do to improve your chances of catching a big fish. And some of those things may be non-intuitive. 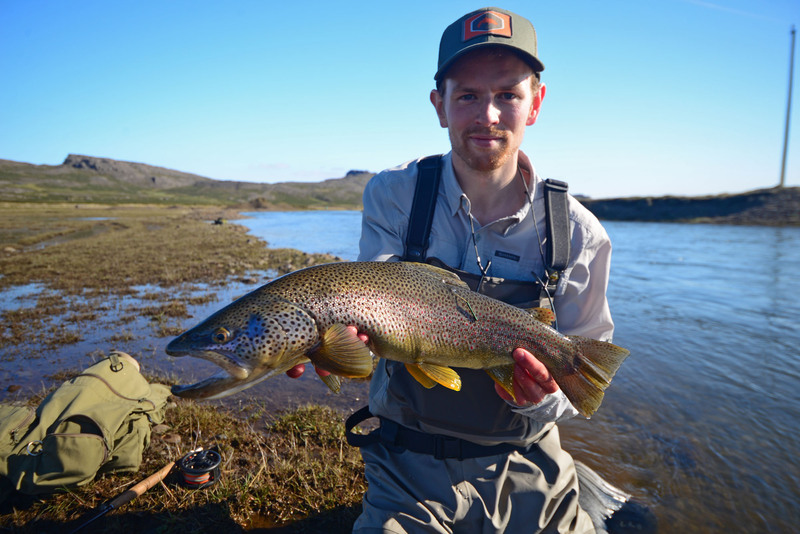 This isn’t going to be your typical ‘throw streamers’ top ten list (although, yes, throwing streamers will help you catch bigger trout). These are more like life philosophies — observations derived from two decades of trying (and often failing) to pull off the big fish trick. In most of these cases, I am not speaking about myself — rather, these are things I’ve seen quality anglers do, and thus they are things I consciously try to imitate. Successful trophy anglers all uniformly have one thing in common: time on the water. You can luck your way into a big fish just as you can luck your way into a big deer on your first-ever hunting trip, but at the end of the day, you are playing the slots. The more you pull that lever, the better your chances of hitting the jackpot. That means you have to put in the time and pay your ante. There is such a thing as fishing karma, and bad luck will eventually regress to the mean and even out. Fish live underwater, right? They don’t care if it’s raining, and they generally like it when it’s gray, when the sun is rising or setting, or when temperatures are below freezing. A lot of big fish are (again, like big deer) more or less confirmed night owls. Successful big fish anglers know these things. You won’t usually see them slogging away when the sky is bluebird, high and bright, and the rivers and lakes are full of playboaters. Instead, they’re getting up at 4AM, or fishing until 4AM. They own gear that allows them to do this comfortably, so they suffer once (at the cash register) rather than every time they go out. Large fish get that way for a reason; they are more elusive, more wary, more paranoid by nature than their brethren. This is how they survived when all their classmates ended up fileted on a plate with a side of lemon. In order to fool fish of this type, quality anglers recognize the need to maximize their opportunities by minimizing or eliminating their own limitations. That means they work on their casting; they study different tactics, and when they do get beat, they learn from their mistakes. It’s one thing to fail to set a hook at a distance a few times, but the definition of insanity is doing the same thing the same way over and over and expecting a different outcome. This is a skillset which has been studied in sports science; it’s called deliberate practice. Tiger Woods, Michael Jordan, and Jeff Gordon all follow principles of deliberate practice, whether they know it or not. Stealth is underrated in fishing, by a lot. After all, most anglers are trained on fish which have never had the time to learn to be wary — your standard stocker rainbow has probably only been in the river for a month or two before falling afoul of your hunchback scud. This gives most anglers a false impression that stealth is irrelevant. You see it all the time; boat anglers blazing in on a gas motor then immediately trolling in as fast as possible. 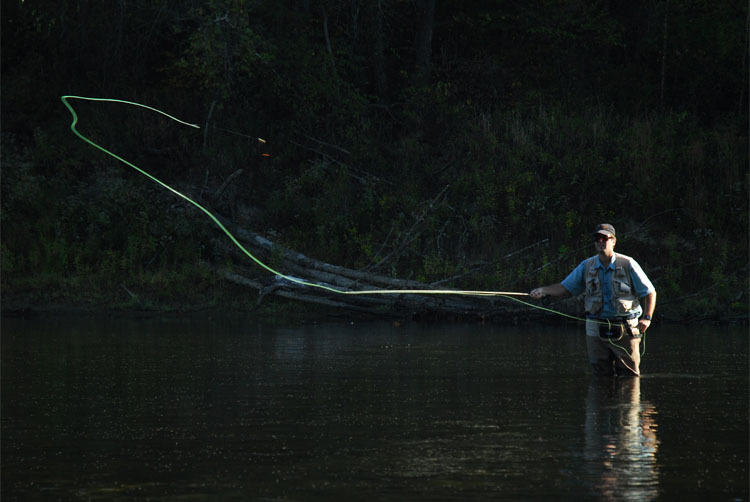 River anglers wading to within thirty feet of a target, sending a cloud of debris down and across with their flies. Even spring creek anglers fail to appreciate just how important it is to avoid lining a fish with false casts. Stealth is a critical part of trophy hunting, and it is an equally important part of trophy fishing. Silence. Slowness. Stillness. The essence of surprise. These factors matter. This is a component of stealth, but it’s something any angler can adopt no matter what the circumstance is. Too many of us approach a likely fish lie as if we were shelling a golf course green in order to set up a short chipshot. We just want to get in the general area, and then when we get closer we figure we’ll seal the deal. This is a terrible strategy in golf (since you blow a stroke getting on the green instead of putting for birdie), and it’s equally bad in fishing. 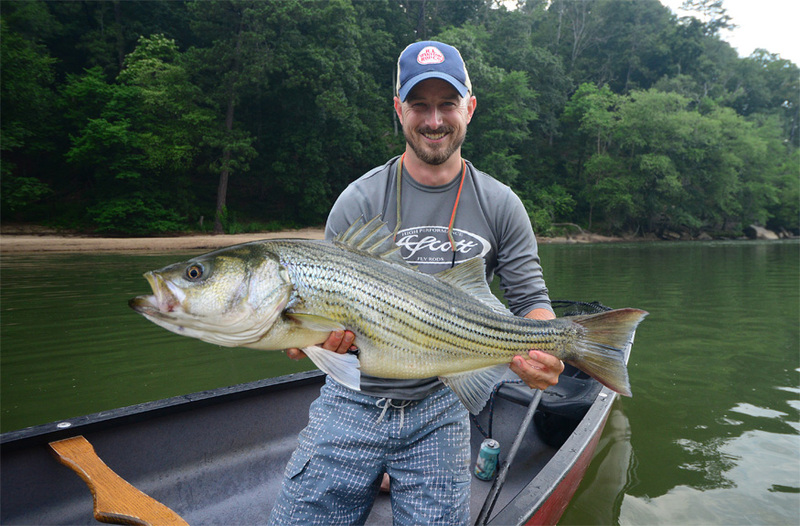 Trophy fish aren’t stupid, and if you slap a fly down ten feet away, they are going to slide under that bank or rock and hide, even if your second cast is right where they were feeding. So make your first cast your best cast; get close enough, don’t line the fish with false casts, and hit your target. I have asked a lot of good anglers what they think separates them from the pack, and they all eventually circle around to one key factor: persistence. Trophy anglers power through failure; they put in time on the water when conditions are good, and they keep going even if they don’t get immediate results. Persistence is a character trait. Its essence is based on confidence, the surety that if you just keep doing something correctly, you will eventually get a good result. It takes a while to build up that confidence, but it takes even more mental grit to ward off the feeling of failure when you know you are doing it right and the results just aren’t coming. A lot of anglers can maintain focus for a couple hours. They start the day out honed in on target, making clean casts and keeping the fly in the zone. Then, they flag. Whether because they get tired, or because they catch fish and get satiated, or because they don’t catch fish and get frustrated; it all ends up in the same place. A beer gets cracked, then three or four more. That swivel chair starts to look comfortable. Pretty soon they’re not even really fishing; they’re just killing time (as well as whoever is on the sticks trying to keep them in place for a nice cast). Trophy anglers go fishing to go fishing. They may know how to have a good time, but while they’re angling, they keep at it. The irony of guide culture is that guides usually wind up taking people fishing at the worst possible times. Think about it; when did you last launch a boat on a guided trip before daylight, so you could be in place when the rise started? When did you keep fishing through full dark, so you could take advantage of both crepuscular periods in the day? Probably never, because guide operations are more about showing people a good time than about catching big fish (which is perfectly fine). Anglers who have only ever fished during banker’s hours may never even have realized that they are leaving the best low-light periods on the table. Meanwhile, trophy anglers are up early, back home in time for a late breakfast, and probably stringing that rod back up as the sun is going down in flames so they can also catch the back half of the day. 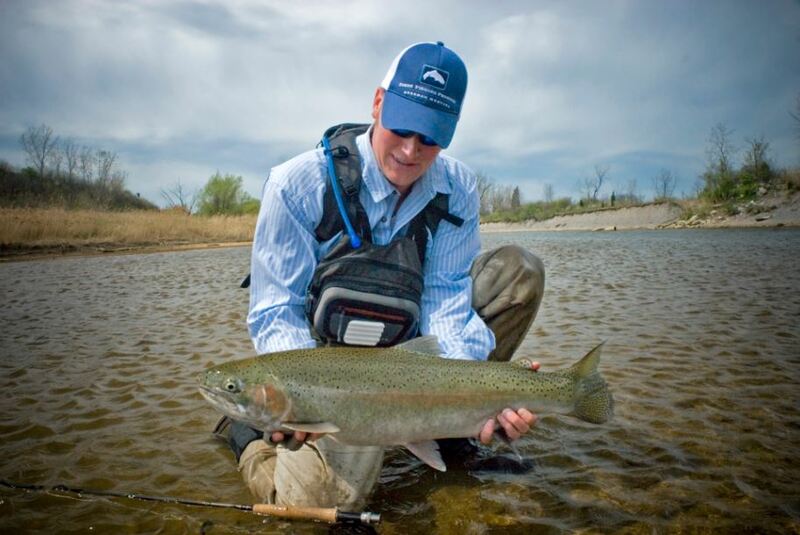 Every fishable river in the country has at least one quality fish in it. No matter how over-fished, how blasted by pollution, how public the river may be, chances are there’s a state record down there somewhere. One of them. Trophy anglers know that is a slot machine you want to avoid. Instead, they make the time in their schedules to hit rivers where big fish opportunities are actually numerous enough to provide a reasonable chance of success. 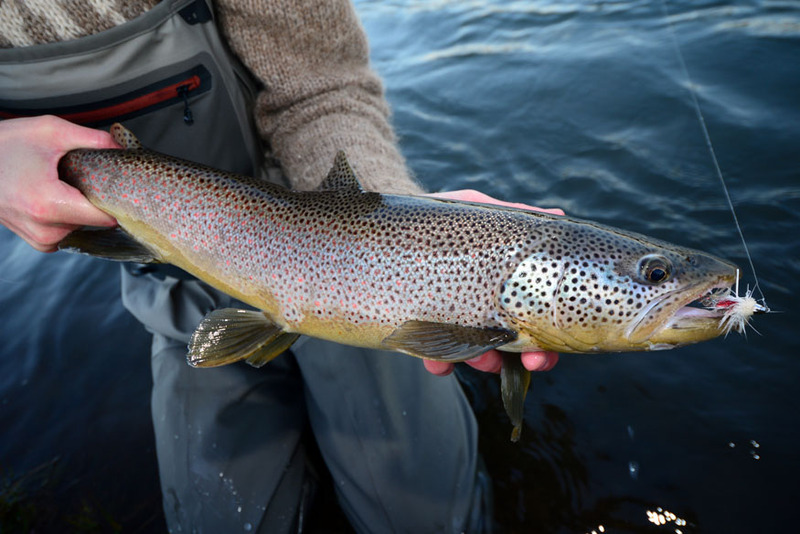 Arkansas’s White River has produced more epic brown trout caught on flies in the last 4 months than most rivers in the Southeast will produce in the next ten years. Guess where the trophy anglers are spending their time? And you know what else? It’s not even that expensive. Gas prices are at all-time lows, and hotel and license fees on the White River are as cheap as they get. Driving to Arkansas is more of a mental obstacle than a financial one for a very large swathe of the country, and if there’s not a White River in your vicinity, chances are there’s something similar. Trophy anglers who figure out how to catch big fish rarely share that information with any but their closest friends. Often they will share misinformation on the internet. The sneakiest of them will mix the misinformation in with otherwise solid advice, generously directing the crowds to go catch fish successfully someplace other than wherever the big fish angler is targeting. The irony of this is that many anglers now believe you can learn just about anything on the internet with enough sleuthing. Truth is, nothing will ever surpass simple exploration and burning through gas and boot leather when it comes to locating big fish. 5 Responses to "Ten Tips for Catching Bigger Fish"
I am a strong advocate of mixing some misinformation in there! Great write up Zach. My experience indicates that FULL moon and NEW moon periods have a positive affect on big fish activity – all other variables being equal. Misinformation? Don’t believe it, the best trophy trout fisherman are 100% truthful. . . honest. I have an area of the river that I’ll tell friends or visitors fishing with me to fish over there are some big browns. To this day I have not yet netted that big fish. Friends have seen, and fought this large brown with no success only the thrill “that was awesome” type of story. One of us will net him one of these days. 4-8 pound are common on this river I live on in Idaho.